What does the audience want to get out of the presentation? What knowledge does the audience want to get? Why is the audience attending? You may have to do some research to get the answers. For example, if you’re speaking at a conference, you may be able to get some demographics from the conference organizers. Look on the conference’s Web site to see what the conference is promising the attendees. Write down your answers to the question (or questions). Then write your content with this in mind. When you’re finished creating the entire presentation, go back to the answers you wrote down. Does your presentation meet the needs and desires of the audience? If not, it’s time to rewrite! 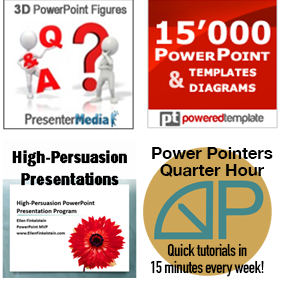 Encouraged by what i read on Powerpoint presentation skills and plan to buy your ebook. Thanks for taking the time to share this, I enjoy reading more on this. That was clever. I’ll be stopping back soon. I really enjoyed reading that. You have touched my heart!